THE Department of Environment and Natural Resources (DENR) 7 conducted on Thursday, March 21, a crown-of-thorns starfish (Cots) removal from the seas of Moalboal, Cebu as a preemptive measure to stop its spread amid the hot weather. A Cots is a seastar named for the spines that cover its body and arms. Mario Marababol, a marine biologist, said Cots naturally occur on coral reefs and help regulate the growth of corals. But because of anthropogenic impact or human disturbance like overfishing and habitat destruction, among others, its natural predators were also depleted. 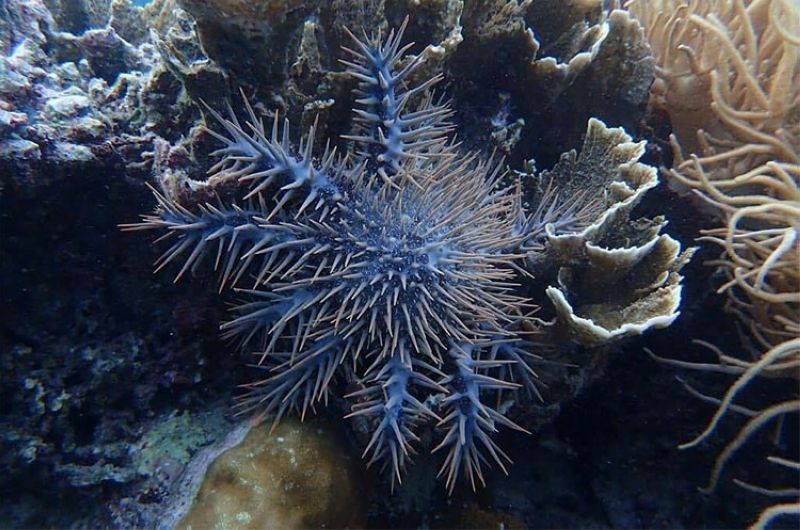 “Based on recent studies, increased water temperature increases the spawning of other organisms that are temperature dependent and one of these organism is this crown-of-thorns starfish,” Marababol said. If there is a Cots outbreak, it will likely kill the corals where the fish feeds itself. “In the long run, productivity of coral reefs will decrease such as larval production of organisms. Why? Because they will consume all coral reefs. In return, coral reef production will be damaged over time. So, there is a domino effect,” Marababol said. If this happens, fish catch in areas where there is a massive presence of crown-of-thorns starfish will likely decrease. “In the long term, an MPA (Marine Protected Area) should be established with proper implementation of the rules and regulations with regular monitoring on its status. If there is still no MPA, the LGU (local government unit) should establish one and establish a fish quota so the stocks will not be depleted,” Marababol said. Volunteer divers and DENR 7 personnel participated in the activity. It was done in the seas off Barangay Saavedra, Moalboal town which is under the jurisdiction of the Tañon Strait Protected Seascape. Lorenz Gideon Esmero of DENR 7 said this activity is already part of their quarterly maintenance and protection activities in the Tañon Strait. This is the first year in the implementation of the activity. Aside from Moalboal, DENR 7 earlier conducted the same in the municipality of Tabuelan where they removed not less than 15 Cots. Esmero explained that they are now conducting the removal of Cots on a quarterly basis especially in marine protected areas where it is commonly found. They used modified thongs to remove the species and placed these in crates. These will be brought to land where they will be buried, Esmero said. The Community Environment and Natural Resources Offices (CENRO) in the different LGUs were already told to conduct a quarterly removal of Cots aside from the reef cleanup and coral bleaching monitoring. Esmero said they are targeting next Barangay Sta. Filomena in Alegria.